This is an historic Top 8 for both players in the upcoming match. Both have something to prove. For Pro Tour Hall of Fame member Luis Scott-Vargas, or LSV, today he's shown that he's still got it. This is Scott-Vargas's first Pro Tour Top 8 in the better part of a decade. He's still extremely active in the Magic community, and is more popular now than he ever has been between his podcasts, commentary, articles, and everything else. But this weekend he's proved his clout is earned. This is his sixth Pro Tour Top 8. 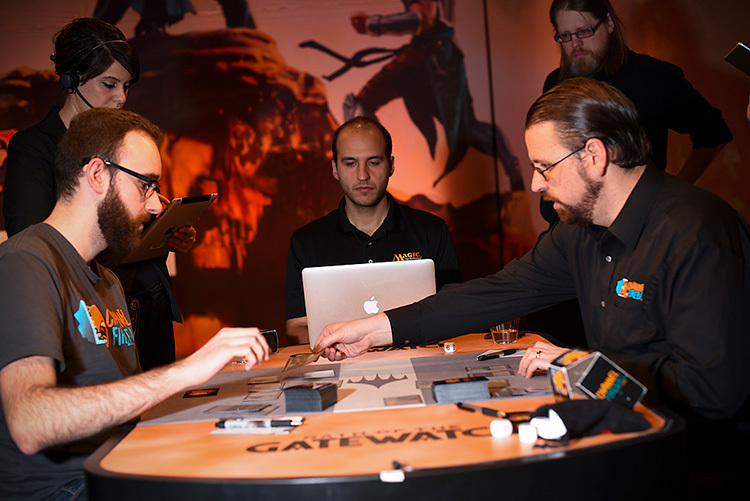 The merging of his ChannelFireball team with Team Face-to-Face Games proved to be a good one. For Quebecois Pascal Maynard, this Top 8 is different proof. Maynard has Top 8'd nine Grand Prix, but after 14 Pro Tour appearances, this is his first Top 8. For a player as good as Maynard, this was long overdue. But now he must prove himself further. And for his nascent squad, Team East West Bowl, a win could put their scrappy crew on the map. "How many Top 8s do you have?" Maynard asked his adversary. Six was the answer. "And how many have you played?" Maynard was deciphering if his trajectory was far behind someone with such a stellar career. The two went back and forth, and Maynard eased after Scott-Vargas told him, "I Top 8'd my twelfth Pro Tour." This was not far off from Maynard. Scott-Vargas added, "It's hard to act like you've been there when you haven't." The two laughed, and shuffled up for the best-of-five. These dueling aggro decks make for an even faceoff. 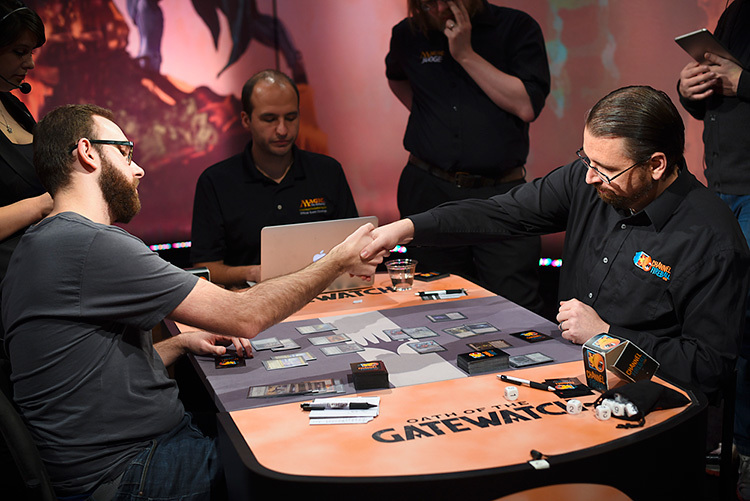 Both Maynard and Scott-Vargas said that the match was close, in the both pre- and post-sideboard games. It would come down to the draws and the plays. Scott-Vargas was higher seeded, so he was the first up. Pascal Maynard finally broke through into his first Pro Tour Top 8, but Hall of Famer Luis Scott-Vargas waits for him in his first match for Sunday. In Luis Scott-Vargas's first two turns, he led with one scariest cards in his deck, two Eldrazi Temple. But rather than windmill an Eldrazi bomb, Scott-Vargas opted for a more controlling opening hand, and only laid Ratchet Bomb. Maynard had an explosive opener in this grip, but the Ratchet Bomb, threatening to clear his best laid plans, gave him pause. He held his 2-drops and cast his Signal Pets, knowing their deaths were imminent. He hoped to bait the Ratchet Bomb on his one-drops, rather than his twos. Around this time LSV stepped on the gas. Hard. He cast a 5/5 Endless One, then a 5/5 Reality Smasher, and took Maynard to 8 life with his first attack. It was brutal. Maynard's team looked downright paltry in comparison. The ten power available to attack next turn potentially made the damage race a 100-meter dash. But the power of lifelink on the Vault Skirge plus Cranial Plating meant that Maynard could gain back life in large chunks. 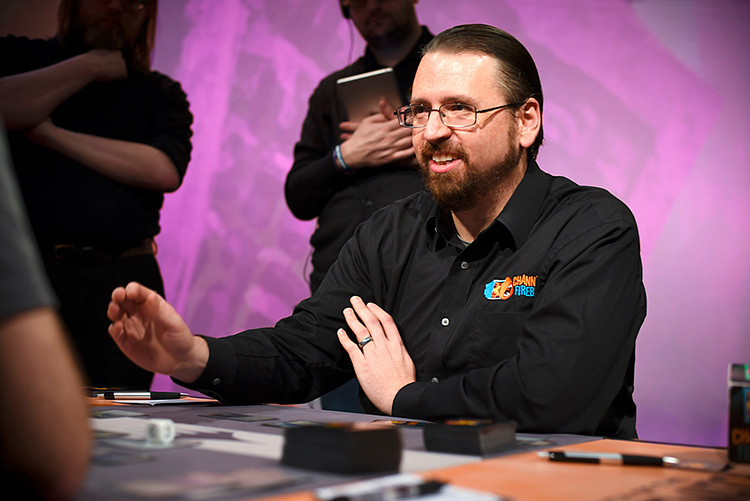 The match might have looked lopsided on the board, but to a veteran like LSV, he was well aware of the robotic danger he faced. After Ratchet Bomb took out the Signal Pests, Maynard made sure he had a litany of 2-drops to follow, his second Vault Skirge and that Cranial Plating. He could race. But Scott-Vargas had the answers, and set them up perfectly. Once the plated-up Skirge came in, a Dismember took it out before Maynard could gain any life. Then a second Reality Smasher, joining the already-monstrous crew, made sure that Maynard never saw his next turn. The rest of the games would be done with the sideboard. With the revived best-of-five rules, the sideboards are vitally important. For Maynard, it was Ancient Grudge. Since many of Scott-Vargas's keys to slow Affinity were artifacts—Chalice of the Void, being paramount—Ancient Grudge could deliver the decisive blow for the win. Maynard under the Sunday lights. On Scott-Vargas's side, the biggest change was Gut Shot. "If a Steel Overseer lives, I lose," he said. Though the Hall of Famer had famously used Gut Shot to take the final point away from fellow Top 8 finisher Frank Lepore in the Swiss rounds, its usual role is to kill permanents like the Overseer and Inkmoth Nexus or Blinkmoth Nexus. Maynard had said, "He has both Gut Shot and Dismember plus Simian Spirit Guide, so even when he's tapped out I can't go all in on a Nexus." The card was pivotal. In the second game, Scott-Vargas kept a hand with all three of those cards and used them to great effect. Then a top-decked Eye of Ugin from Scott-Vargas meant a turn-two Thought-Knot Seer could also nab Arcbound Ravager from Maynard's hand. It was like clockwork. Maynard had kept some heavy hitters; again Scott-Vargas had the answers. Maynard still had play with his Master of Etherium, but Scott-Vargas took it out in the play that decided the match. Scott-Vargas attacked with a 2/2 Endless One into a 2/2 Master of Etherium. Maynard blocked and used a Springleaf Drum to animate Blinkmoth Nexus to pump his blocker. But post-combat Scott-Vargas cast a second Dismember to kill the 1/1 land. This shrunk the Master, causing it to hit the graveyard along with the land. Maynard was at 16, and got his turn back with no relevant permanents in play. The Canadian kept fighting, but Scott-Vargas's hand was a killer. Two turns later, the game was over. LSV was shaking. He was nervous. It must have calmed the Sunday newcomer to see such a master still nervous. But it was little recompense. Maynard was 0-2 and needed three straight wins to make the semifinals. In the third game Maynard had his biggest opening yet: Ornithopter, Springleaf Drum, Signal Pest, Steel Overseer. With double Inkmoth Nexus to boot, he presented an extremely fast clock. The Hall of Famer had Gut Shot for the Overseer, and Ratchet Bomb for Ornithopter, but Maynard was still in the driver's seat. The first-timer followed with Arcbound Ravager so all his artifacts become useful even in death. With a Cranial Plating soon to come, Maynard was ready to deal buckets of damage. Scott-Vargas's first real salvo was a Pithing Needle. It shut down the Ravager shenanigans before it could really start. And with three—count 'em three—Ghost Quarters in play, it was unlikely that Inkmoth Nexus would ever become threatening. Maynard was still driving, but Scott-Vargas was swerving the wheel from the passenger's seat. It was 12-20 in Maynard's favor and Scott-Vargas had two poison counters. 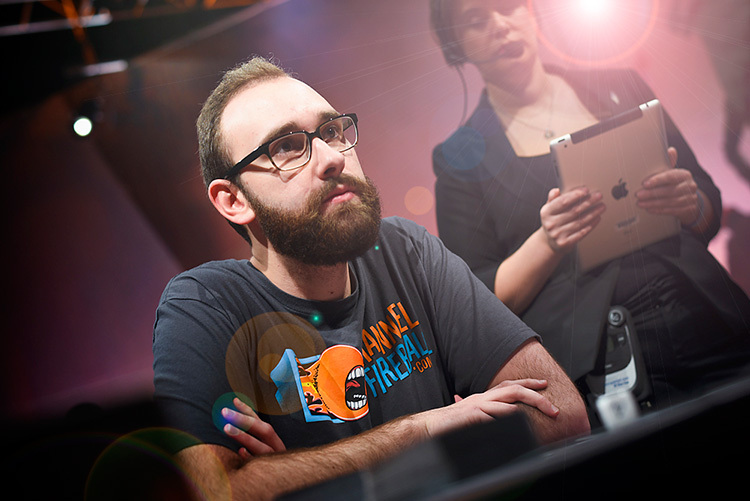 LSV is a household Magic name, and he's reminded everyone why he's in the Hall of Fame this weekend. No matter what Maynard did, Scott-Vargas had the right answer waiting every time. Overseer, Gut Shot; Ravager, Pithing Needle; Nexus; Ghost Quarter. Even the nigh-unblockable Signal Pest stared at a Blinkmoth Nexus on the other side. After Scott-Vargas unloaded some of his guns, Maynard's board shrunk to just a 2/3 Signal Pest with a Cranial Plating (now a 5/3). But Maynard could still get there. A top-decked Cranial Plating showed him yanking back the wheel. The Pest became a 10/3. As Scott-Vargas had tapped his Nexus, the Pest got through unperturbed. "I'm at 2," Scott-Vargas said. He had one turn to figure out what to do. When that one turn came and went, he nodded his head and scooped his cards. Pascal had taken the all-important first game. But now he would be on the draw against another break-neck aggro deck. "I don't need a turn two kill this game. But if we make it Game Five, I need a turn two kill." He was referring to the magical-Christmas-land four Eldrazi Mimic, Eye of Ugin hand. That doesn't happen, ever. "Come on. Save that for the finals." "If I make it to the finals…" Scott-Vargas said. In the fourth game, Maynard got a gift from the gods. Clearly not the Eldrazi gods, as they were on LSV's side. But Scott-Vargas had to mulligan down multiple times. "I can't kill you on turn two with a five-card hand; it's not possible," Scott-Vargas joked. But the joke became less funny when he had to mulligan again. This game Scott-Vargas would start on four. His hand was as good as possible, with two Dismember, Eye of Ugin and Reality Smasher. But it faced seven robotic cards from Maynard, who had two Signal Pest, Memnite, and Vault Skirge on the first two turns. Thanks to a Master of Etherium, the dudes grew. Even a turn-three 5/5 haste and two one-mana kill spells couldn't get Scott-Vargas out of this jam. The Master died, but the follow-up Cranial Plating (threatening to equip to a Vault Skirge) was enough to send this to the rubber game. "Now it's going to be the turn two kill." "End my suffering quick," Maynard pleaded. In the fifth and final game, Scott-Vargas's opener proved to be without mercy. Chalice of the Void, Pithing Needle, and Dismember would blunt any unfair starts on the other side of the board. And he had an Endless One, Eldrazi Mimic, Thought-Knot Seer, and Reality Smasher soon to follow. Though the kill wouldn't be on turn two, Maynard's death would be swift. Or would it? On the third turn (after dispatching the Chalice with an Ancient Grudge), Maynard saw his future when he cast Thoughtseize and gazed at Seer, Smasher, Needle, and Dismember. The time spent in the think tank was earned. But Maynard saw a potential opening, as Scott-Vargas did not have enough land to cast the big guys. So he took the Dismember, cast Cranial Plating, and hoped to cast Master of Etherium the following turn. When Scott-Vargas ripped a land and played Thought-Knot Seer, the lip smack from Maynard was audible. After attacks the life totals were 20-8 for Scott-Vargas, and now Maynard's next-turn action was gone. Maynard entered the "stay-alive" phase of his game and gained life thanks to Vault Skirge and Cranial Plating. But that plan was a sinking ship. However, there was another life boat. Scott-Vargas had a hand of two uncastable Reality Smasher. Inkmoth Nexus plus Cranial Plating put a clock on that plan, and Scott-Vargas had to go to one land fewer, chumping the infecter with Blinkmoth Nexus. But two lands later, the Reality Smasher came. And Maynard's reality smashed in. He fought valiantly, but ephemerally. His death, timely. Maynard was close, but ultimately, it was Scott-Vargas who prevailed in the fifth and final game. Luis Scott-Vargas congratulated Pascal Maynard on his first Pro Tour Top 8, hopefully first of many. But for LSV, this Top 8 was his story. Luis Scott-Vargas defeats Pascal Maynard 3-2 and advances to the semifinals!